Thanks to the Discovery Channel and its “Iditarod: Toughest Race on Earth” show, dog sledding has gained popularity with outdoor recreationists, and a Maine winter provides the perfect place to experience a thrilling ride on a dog-drawn sled. “If people like dogs. and they like being out in the winter, they’re going to like dog sledding,” says Polly Mahoney, co-owner of Mahoosuc Guide Service in Newry. For outdoor recreationists lured by images of mushing through wintry woods, the sport’s greatest attraction probably is the propulsion system: the dogs themselves. “For our customers, we have found the appeal is mostly the relationship with the dogs,” Howe said. Heywood Kennel runs Alaskan huskies, which many people confuse with Alaskan Malamutes and expect to see very large, very furry, beautiful dogs, Howe explained. “We have the mutts of sled dogs — smaller, leaner, faster dogs that still have the tough feet and good coats we need them to have,” she says. Mahoosuc Guide Service has its own breed that they call Yukon huskies, Mahoney said. She and co-owner Kevin Slater have bred their dogs for 33 years. The lineage traces to sled dogs that appeared in the movies “Never Cry Wolf” and “The Call of the Wild,” and to the dogs belonging to the last sled team run by the Royal Canadian Mounted Police in the Yukon Territory. The Mahoosuc dogs weigh between 55 and 90 pounds. Heywood Kennel offers short trips, and Mahoosuc Guide Service offer both day trips and overnight trips in length from two days, one night on the trail, up to 10 days. Most popular are the weekend trips that see customers experiencing the old traditional style of winter camping by sleeping inside canvas-walled tents heated by portable woodstoves, with balsam fir boughs covering the floor, she says. At Heywood Kennel, each ride starts with a kennel tour. “Then the customers get to meet their team,” Howe said, noting that for most it includes lots of pats and pictures. Customers then learn how to fasten the harnesses and hitch dogs to the gangline, which is the harness system connecting the dog team to the sled. After hearing the safety instructions, customers go for a ride. “People enjoy being able to play the part of a real musher,” Howe said. After the sled rides are over, she said the the favorite part is helping take care of the team. Customers interact extensively with the Mahoosuc Guide Service dogs, too. As they’re placed in harness, the dogs are quite excited, ready to go. “When they head off, it’s totally quiet. You hear only the dogs panting and the sound of the runners on the snow,” Mahoney said. 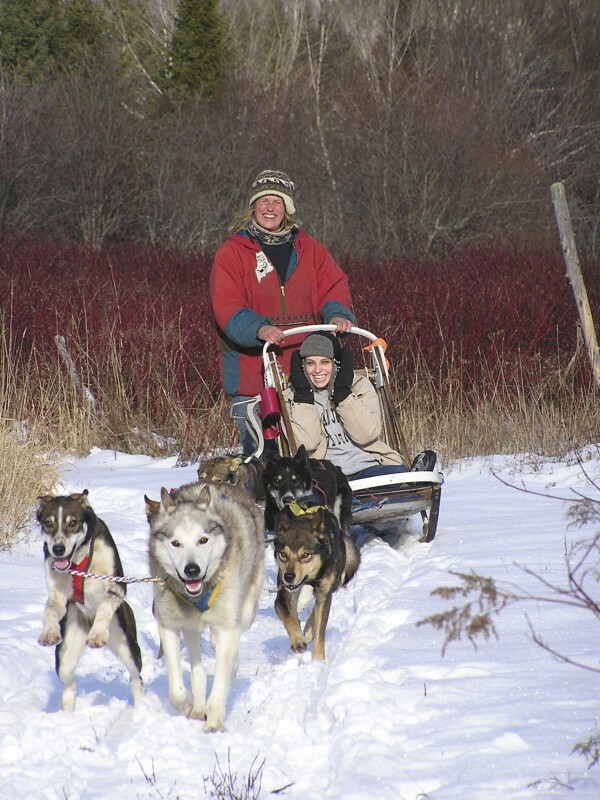 A customer either rides as a passenger or as a musher. At Mahoosuc Guide Service, either Mahoney or Slater guide the lead team, and a customer guides the following team. A day’s ride can cover five to 15 miles. Howe and Mahoney emphasize that mushers must dress appropriately. Mahoosuc Guide Service provides customers with winter boots and insulated parks with insulated hoods. For overnight trips, Mahoney recommends wearing “long johns top and bottom, polar fleece or a wool layer top and bottom,” and wind pants and a wind breaker. To all this clothing add a hat, scarf or neck warmer, glove liners, and insulated mittens or gloves. For more information about Heywood Kennel Sled Dog Adventures, call 629-9260, email heywoodkennel@yahoo.com, or find them on Facebook. For more information about Mahoosuc Guide Service, call 824-2073, email info@mahoosuc.com, or visit mahoosuc.com.